The music event at the Sanctuary last Thursday was attended by an appreciative audience and marks the start of ‘On the Edge’, a new organisation that aims to deliver a new fusion youth orchestra as well as a series of music events in 2012. If you are under 19 and are a gifted and talented young musician based in Birmingham with ambitions to play at the highest level in a wide range of musical styles, we’d like to hear from you. 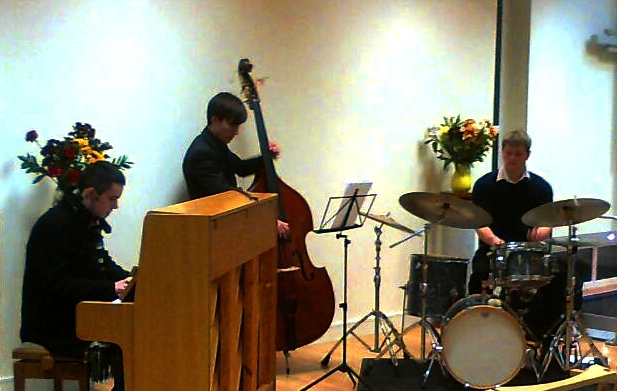 The Jonathan Silk Trio performing at the Sanctuary, Harborne Baptist Church. 'On The Edge' have partnered with Arts Champion, The Drum, to share musical ideas and community collaboration.